Arch Enemy—featuring guitarists Michael Amott andJeff Loomis—have premiered a new song and music video,"The Eagle Flies Alone." You can check it out below. Arch Enemy has revealed a teaser video for the Summer Slaughter 2015 Tour. 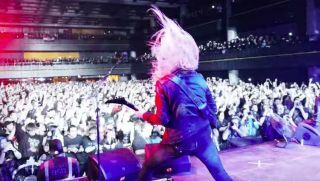 The video features footage of the band performing "Avalanche" live at Hellfest. Dear Guitar Hero: Submit Questions for Jeff Loomis! From his solo shredding skills to his time in Nevermore and his most recent joining of Arch Enemy...nothing's off limits! Arch Enemy have released a pro-shot clip of "As The Pages Burn" as performed at the Masters Of Rock festival July 12 in Vizovice, Czech Republic. Christopher Abbott, a former guitarist of Arch Enemy, has announced a new lineup and album for his band Armageddon. Arch Enemy Premiere New Song, "As the Pages Burn"
Arch Enemy have released a new song, "As the Pages Burn." You can hear it below. Be sure to let us know what you think in the comments or on Facebook. Exclusive: Arsis Premiere Pre-Production Demo of New Song, "Choking on Sand"
Last week, it was announced that Arsis guitarist Nick Cordle had been tapped to join Arch Enemy after the departure of Christopher Amott. Sweden's Arch Enemy have officially parted ways with longtime guitarist Christopher Amott. Amott was a founding member of the band back in 1996, and has been when the band on and off since.